Calhoun Street has changed over the past 200 years with respect to technology and the people who use it, but in many ways it is the same busy and bustling street. One of the earliest accounts of Calhoun Street is from the 1820s when the now paved roads, were made of dirt. Today Calhoun Street is still a place where residents of all backgrounds gather, eat, shop, and enjoy the spirit of Calhoun Street. Scroll down and enjoy these photos from the Community Album– courtesy of the Allen County Public Library. In 1854, the first railroad locomotive was delivered to Fort Wayne, and was built to cross over Calhoun Street. The railroads went to Chicago, Pennsylvania, and Pittsburgh and important reason for the city’s manufacturing boom throughout the 19th century. This postcard picture shows the Calhoun Street railroad viaduct from 1914. The addition of the electric trolley in 1892 to downtown Fort Wayne and Calhoun Street forever changed the way people lived in the city. Before the trolley, most people who worked and shopped in the city also lived in the city. 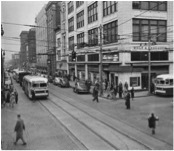 Due to this, the downtown area became more and more dense and industrialized and transportation options grew and brought the trolley to Fort Wayne. The extensive trolley tracks throughout the city allowed for many people to move from downtown to neighborhoods right outside the downtown area such as Lakeside Park and Williams-Woodland Park. This picture of Calhoun Street, the Allen County Courthouse, and local businesses from 1910, was put on a postcard. This is a picture of the Fort Wayne Trolley Cars driving down Calhoun Street on a rainy night in 1938. This was the view of Calhoun Street looking south from Columbia Street. The businesses looking down this street are Hof Brau Café, the local drugstore Clemers Quick Lunch, Centliver Beer, and the Allen County Courthouse. The 1940s were the golden years for downtown Fort Wayne. 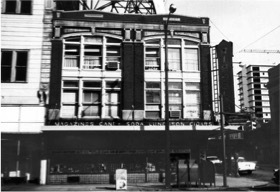 There were hundreds of business located in the downtown area from small shops to restaurants to large department stores, and at the center of the hustle and bustle of the city was the central business district on Calhoun Street. This is a photo of the busy intersection of Calhoun and Washington in the mid-1940s. This was the view of Calhoun Street in February 1945. 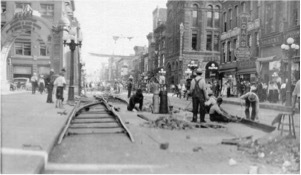 During this time both street cars and trolley coaches were popular modes of transportation in the busy downtown area. 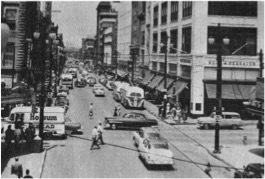 A busy day on Calhoun Street in 1954. 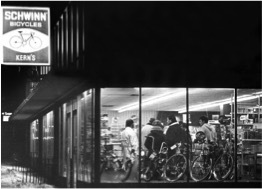 Kern’s Toyland on South Calhoun Street on January 3, 1978.